This set of blank calendars includes both PDF and DOC files. 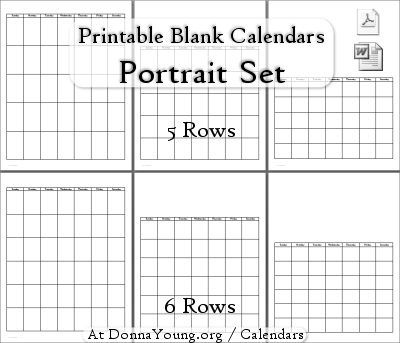 All of the calendars in this set print in portrait orientation. Ready to Print, just open, choose which pages to print. Pages 1, 2, and 3 each have 5 rows. Pages 4, 5, and 6 each have 6 rows. There are two calendars in each of the three layouts mentioned above, one group has 5 rows and the other group has 6 rows. Most of the months can use the calendar with 5 rows.